Ecommerce business plays an important role in the online business industry. So we developed Online Digital Ecommerce Script, so anyone who want to sell their digital products online through our protected platform script. This clone script gives you the capability to sell eBooks, templates, PDF, photos and other digital products. The Customer, vendor, and admin will get benefits from our ecommerce script. The visitor can log in with the valid username and password to enter into the website. In the home page, the user can view the different category of products with the image, price, and review. The visitor can search the products via vendor, product list with keywords, category, and can prospect the quick view links to the today’s deals products, latest products, most sold, and most viewed product details. After selecting the product the user can view full information such as name, title, description, price, reviews, shipping information, features, comments and many more. The customer can add the products to the cart, Wishlist and can compare. The transaction process in the Readymade Digital Store Script will be more safe and secure. The customer can see the statistics of total purchase, wished products and can view the purchase history with date, payment status, delivery status, and invoice details. In the vendor dashboard, they can view the vendor ship type, details, and can see the statistics of total sold, paid by customers, due to admin details. The vendor can add the product details with the full details in the respective category and vendor can manage the sale details with sale code, buyer details, delivery, and payment status and many others. Without any technical and programming skills, the admin can easily handle and manage the category, products, vendors, customer details, coupon details, and others. The code of the Open Source Digital Product Script is developed in WordPress with advanced theme features and SEO friendly plugin. The main features of our Digital Ecommerce Script are advance product search option, profile management, attractive front-end design, powerful and user-friendly admin dashboard, product management, featured products, blog management, compare option, newsletter, vendor dashboard, payment settings, responsive design, user-friendly, Wishlist, social media sharing option, category and location management and many others. 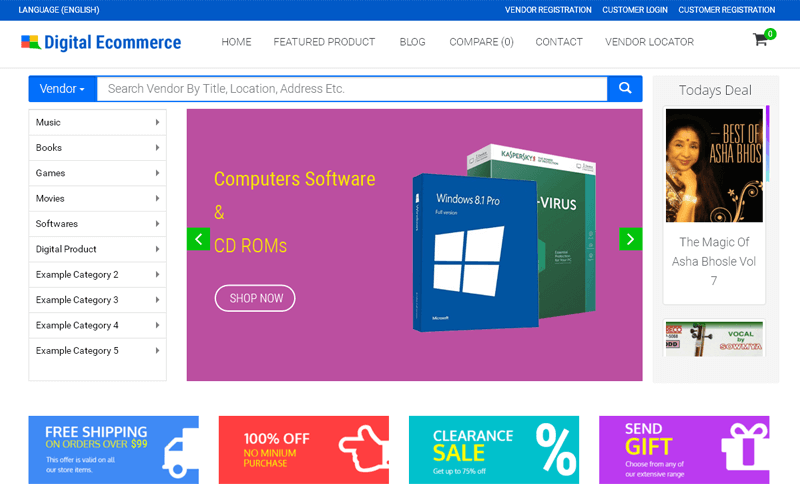 For this Readymade Digital Store Portal, we provide one-year technical support, six month free upgrades of the source code and brand free website. After purchasing our ecommerce script, the site will be live within the next 24 hours. Our Digital Ecommerce Clone Script is the powerful script suits all types of online ecommerce website business. Once you purchase the script We will send The installation Document along with the source file. We also provide one year support for the scripts what we provide. I thank God for showing this script to me because I was surfing in internet for so long time to get the best script with more advantage and finally I have reached this place and bought this script. The script is responsive enough and the developers had made my work so easy. I would ask everyone to go with this script. I can’t describe any words with these guys work because Very clear coding, easy to understand documentation, functionality, search engine friendly settings etc. OUTSTANDING!!!! Thank you so much PHP Scripts Mall for your knowledge and guidance we setting up new website for my business now am very happy. I recommended you to all.